Wednesday features a 10-game slate starting at 7 p.m. ET. Russell Westbrook has not been the same fantasy force this season, posting an average Plus/Minus of -3.52 over his past 10 games on FanDuel. He’s still averaging 9.3 assists and 9.5 rebounds per game this season, but his scoring numbers and usage rate have declined a bit when compared to last season. That said, he’s shooting just 17.6% from 3-point range, so he could be due for some positive regression. Even with his scoring numbers on the decline, Westbrook has still managed to post a Consistency Rating of 87% over the past month on FanDuel. His salary has also decreased by $1,400 over his past 10 games, which could make him an intriguing buy-low target. He has a great matchup vs. the Cleveland Cavaliers, who have allowed the second-most points per 100 possessions this season, and he leads all point guards with 14 Pro Trends on FanDuel. Ben Simmons might be the stud option to pay up for on DraftKings, where his $8,700 salary comes with a Bargain Rating of 95%. The addition of Jimmy Butler has done little to dampen his fantasy value, as he’s posted a positive Plus/Minus in four of his past five games. He has a nice matchup vs. the Knicks, who rank just 27th in defensive efficiency, and the 76ers’ implied team total of 120.5 ranks fourth on the slate. Ryan Arcidiacono is coming off his best game of the season, scoring 34.8 FanDuel points in 36 minutes against the San Antonio Spurs. He has an interesting matchup today vs. the Milwaukee Bucks, who rank sixth in defensive efficiency but are playing at the fourth-fastest pace. Regardless, it’s hard to ignore a point guard playing as many minutes as Arcidiacono at just $3,900 on DraftKings and $4,200 on FanDuel. The Wizards may still hate each other, but they are playing better basketball of late. They’ve won six of their past nine games, and they’re in a great spot for fantasy purposes today vs. the New Orleans Pelicans. They’ve played at the third-fastest pace and rank 27th in defensive efficiency this season, and the Wizards are implied for 118.0 points as a result. John Wall has an excellent individual matchup as well — he owns an Opponent Plus/Minus of +3.31 on FanDuel — and has averaged 1.23 FanDuel points per minute this season. James Harden was absolutely dominant in his last game, which should come as no surprise given that Chris Paul was out of the lineup. He has posted an unreal usage rate of 42.9% in four games without Paul this season and has played an average of 40.6 minutes per game. The result is an average of 61.88 DraftKings points per game, good for an average Plus/Minus of +5.30. He would become one of the top plays of the day if Paul were unable to suit up again, even in a subpar matchup vs. the Dallas Mavericks. Jrue Holiday has failed to return value in each of his past two contests, but has still managed an average Plus/Minus of +5.00 on DraftKings over the past month. He’s averaged 1.23 DraftKings points per minute over that time frame and is in one of the best spots of the day vs. the Washington Wizards. The Wizards rank just 28th in defensive efficiency this season, and the Pelicans’ implied team total of 124 ranks first on the slate. His 12 Pro Trends are tied for the most at the position on DraftKings, where his $8,400 salary comes with a Bargain Rating of 90%. Malik Monk is priced at close to the minimum on both DraftKings and FanDuel but has averaged an excellent 0.96 DraftKings points per minute over the past month. He doesn’t typically play a ton of minutes — he’s currently projected for just 22.5 in our NBA Models — but he doesn’t need to play more than that to potentially return value at his current salary. He’s in a great spot today vs. the Hawks, evidenced by an Opponent Plus/Minus of +2.61 on DraftKings. Credit: Ken Blaze-USA TODAY Sports. Pictured: Charlotte Hornets guard Malik Monk (1). Virtually no one in basketball is playing more minutes than Bradley Beal at the moment. He’s seen at least 41 minutes in three of his past four games and has averaged 1.05 FanDuel points per minute over the past month. He looks like one of the safest options for cash games and has plenty of upside for guaranteed prize pools (GPPs) as well. Pat Connaughton could be an intriguing punt play on FanDuel, where he’s priced at just $3,600. The return of Donte DiVincenzo had no negative effect on his playing time, and Connaughton has scored at least 23.0 FanDuel points in two of his past three games. The Bucks are currently implied for 120.0 points in a strong matchup vs. the Bulls. Giannis Antetokounmpo has averaged 1.66 FanDuel points per minute this season and has played at least 38.5 minutes in back-to-back games. He’s unsurprisingly posted a positive Plus/Minus in each of those contests, and that combination of playing time and production makes him an appealing target on daily fantasy purposes. That said, there’s no guarantee that he’ll see that many minutes on today’s slate given that the Bucks are massive 14-point favorites vs. the Bulls. 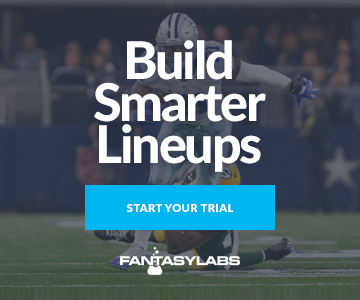 He could still carry value for GPPs, especially since he’s projected for just 9-12% ownership on FanDuel, but there are safer options for cash games. Credit: Jeff Hanisch-USA TODAY Sports. Pictured: Milwaukee Bucks forward Giannis Antetokounmpo (34). Jonathan Isaac saw 30 minutes in Orlando’s last game, and could see a similar workload today if Aaron Gordon is ultimately ruled out. Isaac has averaged a respectable 0.93 DraftKings points per minute with Gordon off the floor this season, and his $3,700 salary comes with a Bargain Rating of 98%. He’s in a nice spot vs. the Portland Trail Blazers, evidenced by an Opponent Plus/Minus of +1.72. Nikola Mirotic continues to look like a value on DraftKings. He’s priced at just $6,900, which represents a decrease of $1,400 compared to his peak of $8,300, and his current salary comes with a Bargain Rating of 95%. He owns an Opponent Plus/Minus of +2.50 on DraftKings and has played at least 37 minutes in each of his past two games. TJ Warren was limited to just 15 minutes two games ago but returned to his normal, massive workload yesterday vs. the Pacers. He’s averaged 0.97 FanDuel points per minute this season, which makes him an appealing target at $6,600. The only things that have been able to stop Anthony Davis recently have been injuries and the Spurs. While we can never rule out a trip to the locker room for AD, everything else seems to line up perfectly for him on today’s slate. He owns an excellent matchup vs. the Wizards, evidenced by an Opponent Plus/Minus of +2.28, and has averaged a Plus/Minus of +5.80 as a home favorite this season (per the Trends tool). This spot is also pretty unprecedented for Davis in terms of his raw scoring potential: The Pelicans’ current implied team total of 124 points dwarfs its previous career-high of 121.75. He’s hard to argue against on DraftKings, where his $11,400 salary comes with a Bargain Rating of 98%. Larry Nance Jr. will draw his second straight start for the Cavs, which makes him one of the strongest values of the day. He played 38.5 minutes in his last game and has averaged 1.05 DraftKings points per minute this season. He doesn’t have a particularly strong matchup vs. the Thunder, but his projected playing time far outweighs that concern at his current salary. Montrezl Harrell’s salary continues to rise, but that hasn’t stopped him from posting an average Plus/Minus of +9.50 over his past 10 games on FanDuel. He’s in an excellent spot vs. the Phoenix Suns, evidenced by an Opponent Plus/Minus of +3.12, and the Clippers’ implied team total of 120.75 ranks third on the slate. Wilson Chandler has PF eligibility on DraftKings, where his $3,600 salary results in a Bargain Rating of 97%. He hasn’t been very productive this season, averaging just 0.59 DraftKings points per minute, but he has played at least 31 minutes in three straight games. He could be an interesting punt play in a #RevengeGame vs. the Knicks. Enes Kanter isn’t exactly priced like a stud at $6,800 on DraftKings, but he’s one of the strongest plays of the day. He’s never had a problem producing fantasy points when on the court — he’s averaged 1.30 DraftKings points per minute over the past month — but his playing time has fluctuated wildly throughout the season. That said, he appears to be in favor with head coach David Fizdale at the moment and has played at least 33 minutes in each of his past three games. He’s scored at least 42.0 DraftKings points in all three of those contests, so he’s just flat out underpriced if he’s going to continue to see that much playing time. Cody Zeller has posted a positive Plus/Minus in each of his past nine games on DraftKings and draws an excellent matchup today vs. the Atlanta Hawks. They rank first in pace and in the bottom two in both offensive efficiency and rebound rate, which is a great combination for a lot of boards. Karl-Anthony Towns has failed to return value in three of his past four games, which has brought his salary down to a reasonable $9,400 on DraftKings for today’s matchup vs. the Spurs. He’s posted a usage rate of at least 27% in each of those contests, so this could be a nice opportunity to buy low on him. Kanter can rack up fantasy points with the best of ’em, but he’s been known to be a sieve on the defense end of the court. He currently ranks 56th out of 57 qualifiers in Defensive Real Plus/Minus (DRPM), which could spell a big day for Joel Embiid. He’s one of the few center options who represents a better value on FanDuel, where his $11,100 salary comes with a Bargain Rating of 81%.